Continuing to enhance its mobile offerings, Facebook on Tuesday unveiled a new look for mobile brand pages aimed at making it easier for users to get key information about local businesses while on the go. The updated pages feature a more streamlined design tailored to smartphone screens. It puts the business address and zoomed-in mapped location front and center to minimize the need for extra taps. Buttons to Like, Check-in, Call or Share have also been moved up toward the top of the layout to expedite business interaction. A company's business page now prominently displays its average star rating. Users can add their own rating and recommendation and see a feed of relevant Timeline posts by friends. As on the desktop, businesses can now pin a post near the top of their mobile page (including offers or videos), and switch easily between the administrative and public views of their Facebook presence. While the changes are rolling out today via mobile browsers and Facebook’s iOS app, page admins don’t need to prepare their pages for the update. Facebook said new mobile pages for the Android app are coming soon. The redesigned mobile pages reflect the company’s efforts to compete with Google, Yelp, YP, and Foursquare to become a key player in mobile local search. “[Facebook’s] commitment to local is really taking off, and that means their focus around small business is accelerating -- and we’re seeing a lot of that not only manifesting itself in mobile, but starting with mobile," said Jed Williams, director of consulting and senior analyst at local media research firm BIA/Kelsey. He notes that the revamped mobile pages follow Facebook’s December launch of the Nearby feature in iOS and Android apps to help users find locals spots, based on their friends’ recommendations and Likes. Speaking at an industry conference last month, Dan Levy, Facebook’s director of small business, said the social network now hosts 15 million pages for local businesses -- up from 13 million at the end of 2012. He said 500,000 pages were using Facebook’s promoted posts to highlight their content, up from 300,000 in December. With the debut of Graph Search on the desktop in January, Facebook has another tool that will eventually help its more than 600 million mobile users navigate the world around them. But Facebook on Tuesday said Pages was the first product it has “redesigned for mobile first,” before the desktop. In that vein, Williams noted how much emphasis the new design places on actionable steps that users can take, such as check-ins and click-to-call and posting ratings. “As consumers get used to finding businesses through Facebook’s mobile search, they’ll feed more content into this engine, which will make Facebook’s data trove that much stronger, and can make its recommendations that much more effective, which would make it even a stronger competitor” in local search, he said. 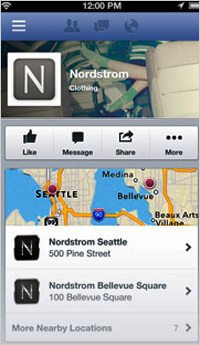 That increased mobile activity could help Facebook generate additional advertising from local businesses.